The company has seen continual growth since it was established in 2008, mainly via word-of-mouth recommendations and repeat business from satisfied customers. 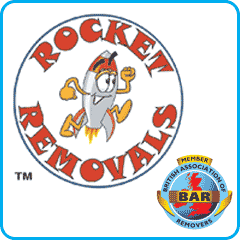 For your reassurance, Rocket Removals has comprehensive goods in transit and public liability insurance; we just require that you pack your goods adequately. A fantastic job today with Scott & Kev, very professional and friendly guys who worked so hard. We couldn’t be happier. Highly recommend. A great experience.